Located 57 miles southwest of New Orleans, Houma, LA is an area ripe with Cajun tradition and culture. 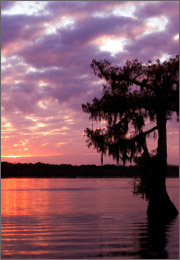 Houma, “The heart of America’s Wetland,” sits within the Gulf Coastal Plain where visitors can marvel at cypress swamps, bayous, alligators, and other assorted wildlife. Additional area attractions include casinos, museums, live Cajun music, shopping, a lively restaurant scene, and the second largest Mardi Gras celebration in Louisiana. If you have a legal issue, you may need the assistance of a Houma lawyer. Houma lawyers can help with such legal matters as business, real estate, personal injury, medical malpractice, wills trusts and estates, and any others you may face. Attorneys in Houma often receive client referrals from Baton Rouge lawyers. Houma attorneys recently defended Houma against a $24 million dollar lawsuit filed against the city for a violation of the Federal Clean Water Act. The plaintiffs, an environmental group, alleged that a 3-mile section of levee was constructed without a permit required to dredge soil and fill in areas of sensitive wetland in violation of the law. A settlement was reached, which requires Houma to maintain a newly-built wetland for a period of five years. Attorneys in Houma may file your case in the Houma City Court, the 32nd Judicial District Court (Terrebonne Parish), the 1st Circuit Court of Appeal, the Louisiana Supreme Court, or a number of specialized courts (handling, for example, family or drug-related matters). A local Houma attorney can help you to navigate the Louisiana court system. Finding the right attorney can be a time-consuming and frustrating process. LegalMatch.com provides free tips on selecting the right attorney and general information related to popular legal topics. LegalMatch also gives you the power to confidentially review the experience, track record, availability, and cost of pre-screened Houma attorneys in your area of legal need. LegalMatch can save you time and money so that you may work with your selected attorney sooner on important matters.